"Last night the one-man Tchaikovsky tribute band, Sergei Bortkiewicz, roared into town with his first symphony and left the BBC SSO, conductor Martyn Brabbins, and the audience, with grins as wide as the Volga … fabulous orchestration, thoroughgoing craftsmanship, and an exuberant panache that raised the whole thing several storeys above mere pastiche. It's a dazzling, hugely enjoyable barnstormer with a gorgeous slow movement (containing an oboe theme to die for), and a punch line so familiar, yet so unexpected, that it's uproarious. Someone tell the London gaffer to put this in the Proms—it would blow the audience clean away." Thus wrote the composer Sergei Bortkiewicz in October 1936 in the last chapter of his autobiography (translated from the German by B N Thadani, Cantext Publications, 1996). Although Vienna was to remain his ‘second home’, he was a composer in exile and, like his fellow compatriots Rachmaninov, Liapunov and Prokofiev, Bortkiewicz longed to return to his homeland and the source of his inspiration, Ukraine. His music became imbued with the passion and melody of his country of birth and this was to culminate in his first symphony, subtitled ‘From my Homeland’. Sergei Eduardovich Bortkiewicz was born in the Ukrainian city of Kharkiv (Kharkov) on 28 February 1877. His background and musical training mirrored that of many of his Russian contemporaries. His mother was an accomplished pianist and co-founder of the Kharkiv Music School, which was affiliated to the Imperial Russian Music Society where Bortkiewicz was to undertake his early music training. He studied piano in Kharkiv under Albert Bensch and early influences included Anton Rubinstein and Tchaikovsky, both of whom visited the school and left an indelible mark upon the young composer-to-be. In 1896 Bortkiewicz enrolled at the St Petersburg Conservatory where he continued to concentrate his musical studies on the piano, initially with Karl van Arek (a pupil of Leschetizky), and then later, to broaden his range of study, he joined the theory class of Anatol Liadov. However, to please his father, who felt that music was not a suitable occupation for his son, he enrolled in the faculty of law at the university and, despite his own disillusionment with having to immerse himself in law books, passed his examinations successfully. Unfortunately this was not to be the case with his music; student unrest in 1899 forced the conservatoire to close and all the students had to extend their studies for another year. This was too much for Bortkiewicz who had already spent three years at the university; he made the decision to forego his final exams and instead decided to undertake his one-year compulsory military service with the Alexander Nevsky Regiment whilst continuing his studies part-time at the Conservatory. Illness and poor health, however, cut short his military service and by the summer of 1900 he was back convalescing on his family estate at Artiomovka near Kharkiv. From there he decided to continue his musical studies in Germany and in the autumn of 1900 enrolled at the Leipzig Conservatoire. He studied composition with Salomon Jadassohn and piano with Alfred Reisenauer, a pupil of Liszt and a celebrated virtuoso whom Bortkiewicz had heard play at the Kharkiv Music School, soon becoming a devoted disciple. Bortkiewicz never established himself as the great pianist he hoped to be, although in his early years he did give concerts across much of Europe, visiting Vienna, Belgrade, Berlin, Paris and Rome (including winning the Schumann Prize on his graduation from Leipzig). But he was aware of his pianistic failings and knew that he was never going to be in the same league as his teacher and mentor. In July 1902 Bortkiewicz completed his studies at Leipzig and, during a summer visit to his parents on their country estate, became engaged to his sister’s schoolfriend, Elisabeth Geraklitova. They married in July 1904 and returned to Germany to live in Berlin, having become enamoured with all things Germanic. In his memoirs, Bortkiewicz clearly felt that his marriage to Elisabeth was going to lead to greater things and he wrote, ‘Now I was married, a new period of my life began’. This new period was marked by his concentrated effort to compose seriously. Like many before him, Bortkiewicz had made youthful attempts at composition but now felt he had the maturity and skills to bring this ability to the fore. His first work was a piano concerto, Op 1, which was played successfully in Berlin. Later, however, for reasons unknown, Bortkiewicz destroyed the work, although fragments of it were later utilised in his Piano Concerto No 2 for left hand alone, Op 28. His Op 2 was a set of songs and his Quatre Morceaux Op 3 for piano were published by Rahter. From 1904 until the outbreak of the First World War Bortkiewicz lived happily in Berlin, visiting his family in Kharkiv during the warmer summer months. He taught briefly at the Klindworth-Scharwenka Conservatoire for a year but left after a disagreement and concertized across Europe and Russia, gradually introducing his own compositions into his programmes. When hostilities began in 1914, Bortkiewicz was placed under house arrest and then deported back to Russia via Sweden and Finland. This was a crushing blow to him and a foretaste of his life to come. He returned to Kharkiv, where things seemed to settle down, and started to teach again. He soon built up a number of promising students around him, most of whom had originally been studying in Moscow and St Petersburg but who had to remain in southern Russia as the war progressed. Bortkiewicz set about rebuilding his career and met Scriabin and Taneyev in Moscow during this period. On 25 March 1918 the Germans finally occupied Kharkiv and the composer could hardly conceal his delight in having Germans as neighbours again: ‘After three days there was complete order; we had light, water, bread, the trains ran flawlessly. The German organizational skill was astounding … I made friends with some German officers and often functioned as an interpreter’. The Germans, however, only stayed until November, and after their departure a new horror was to come crashing upon them—civil war. As with all revolutions, the atrocities soon gained pace and the Bortkiewicz family estate at Artiomovka was completely plundered. As the area became the victim of a tug-of-war between the Red and White Armies, the composer watched his mother and brother-in-law fall ill with typhus, both dying in the chaos of Novorossysk whence the family had fled. The composer decided with his wife to travel to Sevastopol in the Crimea, where they waited, desperate to obtain a passage away from Russia and back to freedom. Finally they were able to obtain passage on a merchant steamer, the Konstantin, which brought them, penniless but safe, to Constantinople in November 1919. The Turkish pianist, Ilen Ilegey, who was court pianist to the Sultan, helped Bortkiewicz to establish himself in Constantinople. He was aware of Bortkiewicz’s compositions and recommended him to important dignitaries in the city. Within a short time the composer was giving lessons to the daughter of the court conductor, the daughter of the Belgian ambassador and the wife of the Yugoslavian ambassador, as well as being invited as a guest to many receptions in the magnificent embassies within the capital. But, despite a growing reputation, Bortkiewicz missed the music and culture of Europe and finally decided to move with his wife to Vienna in July 1922. It was at this point in the composer’s autobiography that he ceased to write any more about his life and all information gathered since about him has been gleaned from the many letters he wrote to his lifelong friend and supporter, the Dutch pianist Hugo van Dalen (1888–1967). The move to Vienna was expected to be his last and he soon established himself within the musical fraternity of the city. In 1926 he obtained Austrian citizenship, but the lure of Germany still remained strong and in 1928 he and his wife moved first to Paris for six months, and from there to Berlin where he remained for almost five years with a number of his works being published by Litolff as well as Rahter. But with the rise of the Nazis in 1933 he was forced again, for being a Russian, to leave Berlin and Germany. He returned to Vienna where he continued to struggle as Europe prepared itself for both invasion and war. I’m writing to you from my bathroom where we have crawled in because it is small and can be warmed on and off with a gas light (!). The other rooms cannot be used and I can’t touch my piano. This is now! What awaits us further? Life is becoming more and more unpleasant, merciless. In fact bombing had destroyed much of the composer’s home including his piano—and even later, when the Russians captured Vienna, he saved himself and a number of his neighbours from getting shot when he spoke to the troop commander in the Russian language. But the effects of the war were to be felt for many years to come and brought Bortkiewicz to the edge of ruin. He lost all income from the sale of his music as the greater part of his compositions printed by his German publishers was destroyed in the many bombing raids. Lack of food, heating, clothing and the basic necessities of life caused considerable hardship and both Bortkiewicz and his wife became seriously ill. It was through the intervention of a friend, Dr Zdrahal, that the couple were admitted to the Franz Joseph Hospital in Vienna to recuperate. Nonetheless, the hardships of the war were to have a lasting effect on Elisabeth who suffered from manic depression for the remainder of her life. Finally I had the opportunity to show, in a large hall with a large orchestra and soloists, what I can do. Not only the critics, but others who know me, were surprised and amazed. […] I can always feel happy to have found so much recognition at the age of 75 years, which really comes in most cases after death to someone who really earned it. […]. Bortkiewicz had been suffering for some time with a stomach ailment and on the advice of his physician he decided to undergo an operation in October 1952. He never recovered and died in Vienna on 25 October that year. His wife, Elisabeth, who was childless, died eight years later in 1960 in Vienna. The graves of Bortkiewicz and his wife are located at the Zentralfriedhof cemetary, Vienna. Bortkiewicz’s style was very much based on Liszt and Chopin, nurtured by Tchaikovsky, Rachmaninov, early Scriabin and Russian folklore. He was unaffected by the musical trends of the twentieth century—the composer never saw himself as a ‘modernist’ as can be seen from his Künstlerisches Glaubensbekenntnis, written in 1923. As The New Grove (1980) says: ‘His workmanship is meticulous, his imagination colourful and sensitive, his piano writing idiomatic; a lush instrumentation underlines the essential sentimentality of the melodic invention’. But Bortkiewicz was not merely an epigone—he very much had his own style that drew upon all the influences of his life that can be immediately recognized as a typically ‘Bortkiewicz sound’. Just now I am working the whole day on my first symphony (she will be called ‘Aus meiner Heimat’). My greatest work up till now! Three parts in sketch already composed. It is almost perfect. Will I die now? Help me to complete this work, then I can die in peace. Around Christmas that year the symphony was completed and the composer had to copy the orchestral parts, possessing no money to have this undertaken by someone else. The first performance of the work was given in Vienna on 30 March 1935 by the Vienna Symphony Orchestra under the baton of Rudolf Nilius. The concert was broadcast across Europe and Bortkiewicz asked Van Dalen to inform the conductor, Mengelberg. In a letter to Van Dalen dated 10 April 1935, the composer wrote of his enthusiasm after the first performance, and he hoped that potential performances in Germany would ease his financial worries. Information from the next two years is scant but in a letter dated 20 February 1937 the composer states: ‘On the 2nd March, my 1st symphony will be performed by Radio Frankfurt. As the conductor Herr Rosbaud puts it, “to honour my 60th birthday”.’ Further letters in March and April of that year confirm this performance (which was also recorded on wax disks for future performances) as well as the first mention of the second symphony: ‘Have heard my symphony from Stuttgart on 30 March 1937 at 1.00am in the night quite well. They were wax disks, which were recorded on March 3rd in Frankfurt. I have finished the 4th movement of my second symphony yesterday. It is quite different from the 1st …’. Again in May 1937 the composer wrote: ‘I have just finished my 2nd symphony. It will be premiered in the next season. It is structured differently from the 1st. I think so myself, and hear from friends that I have been successful with the second, which is perhaps more characteristic than the first. My 1st symphony will soon be performed in Prague and Karlsbad’. Further correspondence mentions both symphonies and of the composer’s attempts to introduce them to a number of conductors. Despite the gathering war-clouds in Europe, the First achieved several performances across Europe under the baton of Kabasta and Steiner. Mengelberg showed particular interest as Bortkiewicz wrote: ‘… Herr Mengelberg greeted me yesterday … however, when I began to play my symphony he was so interested that not only did he hear the whole symphony but spoke about it for a long time, how he liked it and he would report about it and plan a performance …’. Nonetheless, it appears that Mengelberg never conducted the work. However, the promises of performances later in 1939 began to fall by the wayside as Europe braced itself for war. The two symphonic scores were currently with Van Dalen and the composer remained hopeful that they would receive performances under the conductor Eduard Flipse in Rotterdam. In several of his letters during the war years Bortkiewicz mentioned his symphonies and spoke of concern for the two scores, both of which were still in Holland as the war progressed into 1942. A ruling by the German state that handwritten material and manuscripts could not be sent by post in Europe meant that they remained with Van Dalen throughout this period. There was a brief reprise when a possible performance by the Residentie Orchestra of the second was mooted, and the composer even prepared the orchestral parts by hand, but this fell through. (This suggests that another copy of the score, possibly a rough draft, was held by the composer.) Then, as Europe was crushed under the repression of the Nazis, so correspondence between composer and pianist ceased until the summer of 1946. Although the composer enjoyed some concerts of his music during the early years of the war, by 1944 these had been forbidden as Bortkiewicz and his music were seen as too Russian. Nothing is mentioned of either symphony until September 1947 when Bortkiewicz mentioned that Flipse had still hoped to conduct a performance of the second. The composer had made a few alterations to the orchestral parts and wanted to correct the full score still held by Van Dalen. Further pleas for the symphonies to be returned suggest that they remained with Van Dalen for the next two years, and the proposed concert by Flipse fell by the wayside. No further mention of these works is to be found in the composer’s remaining letters. Unfortunately there is no detailed record of the composer’s thoughts about his second symphony. There is also no record of any performances for fifty years until, in February 2002, the work was conducted by Mykola Sukach at a Bortkiewicz festival in Ukraine to celebrate the 125th anniversary of the composer’s birth. The first movement, Allegro ma non troppo in E flat minor, opens with the gentle cry of the oboe which immediately evokes the melancholy that haunts this work. As this opening motif is shared across the orchestra so the composer seems to be expressing a sense of uncertainty and changeable moods, growing from helplessness to titanic power. The brass enter with a phrase that reflects a hymn-like reverence and this in turn introduces the second theme on the strings—a melody that feels imbued with Russian soul, and which gently rises towards a brief but impassioned climax before returning to the lower instrumental depths of the orchestra. The opening motif returns, gradually building in magnitude as it is drawn into a development involving all the themes. Overall, this movement coveys the same sense of loss and sadness that also pervades the composer’s writings from this period. The second-movement scherzo, Vivace, acts as a counterbalance to the first movement, but unlike the buoyant scherzo from his first symphony, this movement still shares with the first movement a sense of sorrow. Its themes feel more dramatic than joyful, particularly those announced by the brass instruments that seem to call out as a theme of ‘Fate’. There is almost a sense of manic energy pervading the first part of this movement—a sense of the madness that was soon to engulf the composer and the people of Europe into war. It sounds stern and merciless, a tide of power that seems to march endlessly on, unstoppable. Bortkiewicz had by this time faced both a world war and a civil war and one can sense his palpable fear of what lay ahead. The Trio offers a moment of brief calm, but the return to the opening Vivace brings a growing sense of menace. The third movement is a tragic lament. This is the raw emotional heart of the symphony, where Bortkiewicz expressed all his sorrow and disillusion with the world. At first there is no sense of joy, no peace, just pure emotive force; yet as the movement progresses the call of a clarinet seems to signal a measure of hope before being swallowed up in the tortured lament of the strings. This hauntingly beautiful movement seems to mourn a forgotten time, place and people. If the third movement feels like it has achieved a sense of purification, the symphony’s finale, Vivace (alla breve), engulfs one with its large-scale epic mood. At its core is a wild Slavonic dance that, as it reaches the coda, quotes the powerful and yet brutal ‘Fate’ theme from the second movement. The work’s exuberant conclusion leaves a great question unanswered: will fear and despair resolve to destroy life, or will mankind finally shape his own destiny? Bortkiewicz, the man, the musician and the composer, still remains an enigma, a mystery, because so many details of his life remain lost or were destroyed in the flames of World War II. A number of works are still missing—a Lyrical Intermezzo for violin and orchestra (Op 44), the opera Akrobaten (Op 50), numerous piano works of his later years including the Six Preludes (Op 66), Three Mazurkas (Op 64), a Cello Sonata (Op 36) and the six pieces Miscellana (Op 61), to name but a few. He even wrote an Olympic Scherzo for the 1948 Olympic Games in London, which won an award, although there is currently no trace of the work. The symphonies too were once a part of this ‘missing’ list and several researchers, including the present writer, have spent many years trying to locate them. Despite letters suggesting that they were held by Van Dalen, this was proved not to be the case, although thankfully the Russian Rhapsody and the Second Piano Sonata were found among the pianist’s papers. As the years passed it was originally felt that they might have been lost either during the war years, or in the aftermath when Europe lay in ruins. The present writer had successfully located a number of his manuscripts in libraries and archives across Europe, but despite all efforts the symphonies remained elusive and were classified as ‘lost’. Then fate played its guiding hand. After a series of rather bizarre coincidences the current writer obtained, from a local antiquarian bookshop, a two-volume set of a list of works held by the Fleisher Collection in Philadelphia. Later that evening, picking up one of the volumes, a small leaflet fell out from the back of the book. It covered acquisitions by the library during the period around 1950 to 1952, and there under ‘Bortkiewicz’ was mention of the two symphonies. I immediately contacted the library and, after some checking, the scores were located in their archive. Apparently Bortkiewicz had sent copies of the symphonies (both full scores and parts) to them for safekeeping. Further research later unearthed another copy of the First Symphony in the archive of Doblingers in Vienna. Thus, after a silence of over fifty years, the symphonies of Bortkiewicz can now be heard and appreciated once more. 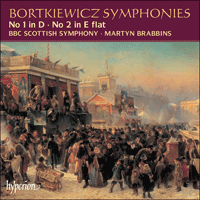 This began with a performance of the First Symphony in Kiev in 2001, followed by the British premiere in Glasgow in 2002 under Martyn Brabbins. The music authorities in Ukraine have recently shown immense interest in the life and music of Bortkiewicz and, to mark the 125th anniversary of the composer’s birth, there was a successful performance of the Second Symphony in Kiev. Here at last, in his homeland, Bortkiewicz has been re-established and honoured as a composer of great beauty, passion and melody. The exile had finally returned home. Ces mots sont ceux du compositeur Sergueï Bortkiewicz, en octobre 1936, dans le dernier chapitre de son autobiographie (traduite d’allemand en anglais par B. N. Thadani, Cantext Publications, 1996). Si Vienne reste sa «seconde patrie», Bortkiewicz est un compositeur en exil et, comme ses confrères Rachmaninov, Liapounov ou Prokofiev, il aspire à retourner dans son pays natal, à la source de son inspiration, l’Ukraine. Sa musique sera imprégnée de la passion et des mélodies de son pays d’origine, tendance qui culminera dans sa première symphonie, sous-titrée «À ma patrie». Sergueï Édouardovitch Bortkiewicz est né à Kharkiv (anciennement Kharkov), en Ukraine, le 28 février 1877. Ses origines et sa formation musicale reflètent celles de nombre de ses contemporains russes. Sa mère est une pianiste émérite, cofondatrice de l’école de musique de Kharkiv, affiliée à la Société de musique impériale russe où Bortkiewicz commence ses études musicales. En piano, il est l’élève d’Albert Bensch à Kharkiv et, très jeune, est influencé par Anton Rubinstein et par Tchaïkovski qui tous deux rendent visite à l’école et laissent une marque indélébile sur le jeune compositeur en herbe. En 1896, Bortkiewicz entre au conservatoire de Saint-Pétersbourg, où il continue à privilégier le piano, au départ dans la classe de Karl van Arek (élève de Leschetizky), avant d’élargir son champ d’étude en s’inscrivant dans la classe de théorie d’Anatole Liadov. Pour faire plaisir à son père, qui estime que son fils à mieux à faire que de la musique, il s’inscrit cependant à la faculté de droit de l’université, et, malgré les désillusions que lui procure son immersion dans l’étude de la loi, passe ses examens avec succès. Il n’en va malheureusement pas de même en musique; suite à des manifestations d’étudiants en 1899, le conservatoire doit fermer, et tous les élèves sont contraints de redoubler leur année. C’en est trop pour Bortkiewicz, qui a déjà passé trois ans à l’université et qui décide de ne pas présenter ses examens de fin d’études, préférant regagner le régiment Alexandre Nevski pour y faire son année de service militaire obligatoire, tout en poursuivant à temps partiel son cursus au conservatoire. Mais des problèmes de santé interrompent son service militaire et, dès l’été 1900, il est de retour dans la propriété familiale, à Artiomovka, près de Kharkiv, pour y achever sa convalescence. Il décide alors de poursuivre sa formation musicale en Allemagne et, à l’automne 1900, s’inscrit au conservatoire de Leipzig. Il entre dans la classe de composition de Salomon Jadassohn, et dans celle de piano d’Alfred Reisenauer, ancien élève de Liszt et virtuose célèbre qu’il a entendu jouer à l’école de musique de Kharkiv, et dont il devient bientôt un disciple fervent. Bortkiewicz ne s’affirmera jamais comme le grand pianiste qu’il avait espéré devenir, même s’il donne des concerts dans une grande partie de l’Europe, notamment à Vienne, Belgrade, Berlin, Paris et Rome (remportant en outre le prix Schumann à la fin de ses études à Leipzig). Mais il a conscience de ses lacunes en tant que pianiste et sait qu’il ne se mesurera jamais à l’aune de son professeur et mentor. En juillet 1902, ses études à Leipzig sont terminées; pendant l’été, il rend visite à ses parents dans leur propriété à la campagne, et là se fiance avec Élisabeth Geraklitova, amie d’école de sa sœur. Les jeunes gens se marient en juillet 1904 et, épris de tout ce qui est allemand, retournent en Allemagne pour s’établir à Berlin. Dans ses mémoires, Bortkiewicz a clairement le sentiment que son mariage à Élisabeth est le début de grandes choses, concluant: «À présent que j’étais marié, une nouvelle phase de mon existence commençait.» Cette nouvelle phase le voit mobiliser toute son énergie pour se mettre sérieusement à la composition. Comme nombre de ses prédécesseurs, Bortkiewicz a déjà quelques essais de jeunesse à son actif, mais il se sent désormais la maturité et la technique nécessaires pour percer. Sa première composition est un concerto pour piano opus 1, donné avec succès à Berlin. Pour des raisons que l’on ignore, Bortkiewicz détruira par la suite ce manuscrit mais en réutilisera des fragments dans son Deuxième Concerto pour piano pour la main gauche, opus 28. Son opus 2 est un recueil de mélodies et ses Quatre morceaux opus 3 pour piano sont publiés chez Rahter. De 1904 jusqu’au début de la Première Guerre mondiale, Bortkiewicz vit heureux à Berlin, rendant visite à sa famille, à Kharkiv, pendant les mois d’été, plus cléments. Il enseigne brièvement au conservatoire Klindworth-Scharwenka, pendant un an, mais démissionne à la suite d’un désaccord et donne des concerts en Europe et en Russie, introduisant peu à peu ses propres compositions dans ses programmes. Au début des hostilités, en 1914, Bortkiewicz est assigné à domicile avant d’être reconduit de force en Russie, via la Suède et la Finlande. C’est pour lui un coup terrible et un avant-goût de son existence à venir. Il rentre à Kharkiv, où la vie semble vouloir reprendre un cours normal, et recommence à enseigner. Il se constitue bientôt un groupe d’élèves prometteurs, ayant pour la plupart commencé leurs études à Moscou ou à Saint-Pétersbourg avant que l’évolution de la guerre ne les contraigne à retourner dans le Sud de la Russie. Bortkiewicz cherche à relancer sa carrière et rend visite à Scriabine et à Taneïev à cette époque. Le 25 mars 1918, les Allemands occupent finalement Kharkiv, et le compositeur a le plus grand mal à cacher sa joie d’avoir de nouveau des Allemands pour voisins: «Au bout de trois jours, un ordre parfait régnait; nous avions de la lumière, de l’eau, du pain, les trains circulaient impeccablement. Les talents d’organisateurs des Allemands étaient stupéfiants […] Je me liai d’amitié avec des officiers allemands et eus souvent l’occasion de servir d’interprète.» Mais les Allemands ne restent que jusqu’en novembre, et une nouvelle horreur succède à leur départ: celle de la guerre civile. Comme pendant toutes les révolutions, les atrocités ne tardent pas à se multiplier, et la propriété familiale des Bortkiewicz, à Artiomovka, est complètement pillée. Tandis que l’Armée rouge et l’Armée blanche se disputent la région, le compositeur voit tour à tour sa mère et son beau-frère tomber malades du typhus, puis en mourir dans le chaos de Novorossisk où la famille a fui. Avec sa femme, le compositeur décide de se rendre à Sébastopol, en Crimée, où ils attendent désespérément de trouver un moyen de quitter la Russie pour recouvrer la liberté. Ils parviennent enfin à trouver des places sur un navire de commerce à vapeur, le Konstantin, qui les dépose, sans un sou, mais sains et saufs, à Constantinople en novembre 1919. Le pianiste turc Ilen Ilegey, pianiste à la Cour du Sultan, aide Bortkiewicz à s’établir à Constantinople. Connaissant les compositions de l’Ukrainien, il le recommande à plusieurs dignitaires importants de la ville. Très vite, Bortkiewicz commence à donner des leçons à la fille du chef d’orchestre de la Cour, à la fille de l’ambassadeur de Belgique et à la femme de l’ambassadeur de Yougoslavie, et se retrouve invité à de nombreuses soirées dans les magnifiques ambassades de la capitale. En dépit de sa réputation grandissante, Bortkiewicz a néanmoins la nostalgie de la musique et de la culture européennes et se décide finalement à partir pour Vienne avec sa femme, en juillet 1922. C’est à ce point de son autobiographie que le compositeur cesse totalement d’écrire sur sa vie, et toutes les informations réunies à ce sujet proviennent des nombreuses lettres qu’il adresse à son ami et soutien de toute une vie, le pianiste néerlandais Hugo van Dalen (1888–1967). Persuadé que son déménagement à Vienne sera le dernier de sa vie, il ne tarde pas à trouver sa place au sein de la fraternité musicale de la ville. En 1926, il obtient la citoyenneté autrichienne, mais l’attrait de l’Allemagne reste fort et, en 1928, sa femme et lui passent d’abord six mois à Paris, puis gagnent Berlin où le compositeur demeure près de cinq ans, faisant paraître un certain nombre d’œuvres chez Litolff et chez Rahter. La montée du nazisme, à partir de 1933, le contraint de nouveau, en tant que Russe, à fuir Berlin et l’Allemagne. Il retourne à Vienne où il continue à survivre tant bien que mal tandis que l’Europe se prépare à l’invasion et à la guerre. Je t’écris depuis la salle de bain où nous nous sommes réfugiés car elle n’est pas grande, et nous pouvons la réchauffer par intermittences grâce à l’éclairage au gaz (!). Les autres pièces sont inhabitables et je ne peux toucher à mon piano. Telle est la situation aujourd’hui! Ce qui nous attend demain? La vie devient de plus en plus désagréable, impitoyable. En fait, le domicile du compositeur, y compris son piano, a été en grande partie détruit par les bombardements; plus tard, lorsque les Russes prendront Vienne, il ne devra de sauver sa vie, et celle d’un certain nombre de ses voisins, qu’à sa capacité de s’adresser en russe à l’officier en chef. Mais les conséquences de la guerre se font sentir pendant de nombreuses années encore, et Bortkiewicz se retrouve pratiquement ruiné. Il ne touche plus de droits d’auteur sur la vente de sa musique, puisque la plupart de ses partitions publiées par ses éditeurs allemands ont été détruites au cours des nombreux bombardements. Privés d’un bon nombre des nécessités essentielles de l’existence, mal nourris, mal chauffés, mal habillés, sa femme et lui tombent gravement malades. C’est grâce à l’intervention d’un ami, le Dr Zdrahal, que le couple est admis à l’hôpital Franz Joseph, à Vienne, pour y reprendre des forces. Mais les épreuves de la guerre auront des conséquences durables pour Élisabeth, qui souffrira de psychose maniaco-dépressive pendant le reste de sa vie. En octobre 1952, Bortkiewicz, qui souffre depuis quelque temps d’une maladie de l’estomac, décide, sur les conseils de son médecin, de se faire opérer. Il ne s’en remet pas et meurt à Vienne le 25 octobre. Sa femme Élisabeth, qui n’a jamais eu d’enfants, meurt huit ans plus tard, en 1960, à Vienne. Les tombes des deux époux se trouvent au cimetière viennois du Zentralfriedhof. Le style de Bortkiewicz s’inspire en grande partie de celui de Liszt et de Chopin et se nourrit des compositions de Tchaïkovski, de Rachmaninov, des premières œuvres de Scriabine et du folklore russe. Insensible aux courants musicaux du XXe siècle, le compositeur ne s’est jamais considéré comme un «moderniste», comme le montre son Künstlerisches Glaubensbekenntnis, écrit en 1923. Pour reprendre les termes du New Grove (1980): «C’est un technicien méticuleux, dotée d’une imagination colorée et sensible, à l’écriture pianistique idiomatique; une instrumentation luxuriante souligne le caractère essentiellement sentimental de son invention mélodique.» Mais Bortkiewicz n’est pas un simple épigone; il a un style bien personnel, enrichi de toutes les influences de son existence, et le «son Bortkiewicz» se reconnaît d’emblée. En ce moment, je passe mes journées entières à travailler à ma première symphonie (qui s’intitulera «Aus meiner Heimat»). Ma plus grande œuvre à ce jour! J’ai déjà esquissé trois parties. C’est presque parfait. Vais-je mourir? Si seulement je pouvais terminer cette œuvre, je pourrais ensuite mourir en paix. La symphonie est achevée aux alentours de Noël de cette même année, et le compositeur doit lui-même copier le matériel d’orchestre, n’ayant pas les moyens de déléguer ce travail. L’œuvre est créée à Vienne le 30 mars 1935, par l’Orchestre symphonique de Vienne sous la direction de Rudolf Nilius. Le concert est retransmis en Europe, et Bortkiewicz demande à Van Dalen d’en informer le chef d’orchestre Mengelberg. Dans une lettre à Van Dalen datée du 10 avril 1935, le compositeur lui dit son enthousiasme après la première, et compte sur de nouvelles exécutions en Allemagne pour diminuer ses soucis financiers. La suite de la correspondance mentionne les deux symphonies, et les tentatives du compositeur pour les faire connaître d’un certain nombre de chefs d’orchestre. En dépit des nuages de guerre qui s’accumulent au-dessus de l’Europe, la 1re Symphonie est jouée plusieurs fois dans toute l’Europe sous la direction de Kabasta et de Steiner. Mengelberg se montre particulièrement intéressé, comme le raconte Bortkiewicz: «… Herr Mengelberg m’a salué hier […] cependant, lorsque j’ai commencé à lui jouer ma symphonie, il a été si intéressé que non seulement il l’a écoutée en entier mais qu’il en a longuement discuté, disant combien elle lui plaisait, qu’il en parlerait autour de lui et programmerait une exécution…» Il semble néanmoins que Mengelberg n’ait jamais donné cette œuvre. Mais les promesses de nouvelles exécutions au cours de l’année 1939 sont oubliées alors que l’Europe se prépare à la guerre. Les deux partitions symphoniques sont alors en la possession de Van Dalen, et le compositeur conserve l’espoir qu’elles seront données sous la direction d’Eduard Flipse à Rotterdam. Dans plusieurs de ses lettres, au cours des années de guerre, Bortkiewicz mentionne ses symphonies et exprime son inquiétude à propos des deux partitions, qui demeurent aux Pays-Bas alors que la guerre dure toujours en 1942. En raison d’un décret de l’État allemand interdisant l’expédition postale en Europe de tout document manuscrit, Van Dalen doit garder les partitions durant toute cette période. Le compositeur a un bref moment d’espoir lorsqu’il est question d’une exécution de la 2e Symphonie par le Residentie-Orkest, et il prépare même à la main un matériel d’orchestre, mais le projet finit par tourner court. (Ceci laisse à penser que le compositeur avait en sa possession un autre exemplaire de la partition, peut-être un brouillon.) La correspondance entre le compositeur et le pianiste s’interrompt ensuite, jusqu’à l’été 1946, tandis que l’Europe est écrasée sous la répression des nazis. Si le compositeur a pu entendre sa musique en concert à quelques reprises durant les premières années de la guerre, elle est interdite à partir de 1944, l’œuvre et le compositeur étant jugés trop russes. Rien ne filtre à propos d’aucune des deux symphonies jusqu’en septembre 1947, époque à laquelle Bortkiewicz mentionne que Flipse espère encore diriger une exécution de la 2e. Le compositeur a apporté quelques modifications au matériel d’orchestre et souhaite corriger la grande partition, toujours en la possession de Van Dalen. De nouvelles demandes de retour des symphonies suggèrent qu’il les garde par-devers lui au cours des deux années suivantes, et le projet de concert avec Flipse avorte. Aucune nouvelle mention de ces deux œuvres n’apparaît dans les lettres subsistantes du compositeur. Nous ne disposons malheureusement pas d’informations détaillées sur les idées du compositeur à propos de cette 2e Symphonie. Il ne semble pas non plus qu’elle ait jamais été donnée en public durant cinquante ans, jusqu’à son exécution sous la direction de Mykola Sukach, en février 2002, lors d’un festival Bortkiewicz en Ukraine, célébrant le 125e anniversaire de la naissance du compositeur. Le premier mouvement, «Allegro ma non troppo», en mi bémol mineur, débute par un appel plein de douceur du hautbois qui évoque aussitôt la mélancolie dont l’œuvre est habitée. Tandis que ce motif initial se répand à l’orchestre, le compositeur semble exprimer ses incertitudes et son humeur changeante, passant de la vulnérabilité à un pouvoir titanesque. Les cuivres font leur entrée sur une phrase reflétant une révérence proche de l’hymne, qui introduit à son tour le deuxième thème aux cordes, une mélodie donnant le sentiment d’être pénétrée de l’âme russe, et s’élevant doucement vers un paroxysme bref mais passionné avant de retourner dans les profondeurs instrumentales de l’orchestre. Le motif initial revient, prenant peu à peu de l’ampleur au fur et à mesure où le développement, basé sur l’intégralité des thèmes, s’en empare. Dans l’ensemble, il se dégage de ce mouvement le même sentiment de perte et de tristesse qui prédomine dans les écrits du compositeur à l’époque. Le deuxième mouvement, un scherzo marqué «Vivace», vient contrebalancer ce premier mouvement, mais sans se déparer du sentiment de douleur qui l’habitait, à la différence du scherzo plein d’entrain de la 1re Symphonie. Ses thèmes ont une sonorité plus dramatique que joyeuse, notamment ceux énoncés par les cuivres qui semblent affirmer un thème de «Fatalité». Une énergie presque maniaque anime la première partie de ce mouvement—comme un pressentiment de la folie qui bientôt engloutira le compositeur et toutes les populations d’Europe dans la guerre. Avec ses sonorités austères et implacables, c’est un déferlement de pouvoir dont l’avancée semble interminable, irrésistible. À ce stade, Bortkiewicz a déjà affronté une guerre mondiale et une guerre civile, et sa crainte de l’avenir est ici palpable. Le Trio offre un bref moment de répit, mais la reprise du Vivace initial introduit un sentiment croissant de menace. Le troisième mouvement est une plainte tragique. C’est ici le cœur à vif de la symphonie, où Bortkiewicz exprime toute sa peine et sa désillusion quant au monde dans lequel il vit. Nul sentiment de joie ou de paix au départ, rien d’autre qu’une puissance émotive brute ; pourtant, le mouvement progressant, un appel de clarinette semble annoncer une lueur d’espoir avant d’être englouti par la plainte torturée des cordes. Ce mouvement d’une beauté envoûtante semble pleurer une époque, un lieu, des être oubliés. Si le troisième mouvement donne le sentiment d’avoir atteint à une certaine purification, le finale de la symphonie, «Vivace (alla breve)», nous engloutit dans son atmosphère épique à grande échelle. Il est centré sur une danse slave effrénée qui cite le thème puissant mais brutal de la «Fatalité» du deuxième mouvement au moment de la coda. La conclusion exubérante de l’œuvre laisse sans réponse une question essentielle: la peur et le désespoir déboucheront-ils sur la destruction de la vie, ou l’humanité finira-t-elle par façonner sa propre destinée? Bortkiewicz, l’homme, le musicien et le compositeur, demeure une énigme, un mystère, du fait que de nombreux détails de sa vie ont été perdus ou détruits dans les flammes de la Deuxième Guerre mondiale. Un certain nombre d’œuvres manquent toujours—un Intermezzo lyrique pour violon et orchestre (op. 44), l’opéra Akrobaten (op. 50), de nombreuses œuvres pour piano de la fin de sa vie, dont Six Préludes (op. 66), Trois Mazurkas (op. 64), une sonate pour violoncelle (op. 36) et les six pièces Miscellana (op. 61), pour n’en citer que quelques-unes. Il a même écrit un Scherzo olympique à l’occasion des Jeux olympiques de Londres, en 1948, qui lui a valu un prix quoique l’on n’en ait retrouvé aucune trace à ce jour. Les symphonies faisaient elles aussi partie, naguère, de cette liste des «disparus», et plusieurs chercheurs, y compris l’auteur de ces lignes, ont passé de nombreuses années à essayer de les localiser. En dépit de lettres suggérant qu’elles étaient en la possession de Van Dalen, il s’est avéré qu’il n’en était rien, quoique l’on ait heureusement retrouvé parmi les papiers du pianiste la Rhapsodie russe et la 2e Sonate pour piano. Les années passant, on a d’abord craint qu’elles aient disparu, soit pendant les années de guerre soit au lendemain du conflit, alors que l’Europe était en ruines. Le soussigné avait réussi à retrouver un certain nombre des manuscrits du compositeur dans les bibliothèques et les archives de différentes régions d’Europe mais, en dépit de tous ses efforts, les symphonies restaient introuvables et étaient considérées comme perdues. Jusqu’au jour où le sort a pris les choses en main. Suite à une série de coïncidences assez bizarres, l’auteur de ces lignes obtient d’un bouquiniste local, spécialisé dans les ouvrages anciens, un recueil en deux volumes contenant une liste des œuvres appartenant à la Collection Fleisher, à Philadelphie. Ce soir-là, une brochure qui y était glissée tombe d’un des deux volumes alors qu’il le manipule. Elle répertorie les acquisitions de la bibliothèque dans les années 1950 à 1952, et là, sous l’entrée «Bortkiewicz», figure une mention des deux symphonies. Je contacte aussitôt la bibliothèque qui, vérification faite, localise les partitions parmi ses archives. Bortkiewicz lui avait apparemment envoyé un exemplaire de ses symphonies (grande partition et matériel d’orchestre) pour les mettre à l’abri. De nouvelles recherches ont par la suite permis de retrouver un autre exemplaire de la 1re Symphonie parmi les archives Doblingers à Vienne. Et c’est ainsi qu’après un silence de plus de cinquante ans il nous est aujourd’hui possible d’écouter et d’apprécier de nouveau les symphonies de Bortkiewicz. Cette résurrection a commencé par une exécution de la 1re Symphonie à Kiev en 2001, suivie de la création britannique à Glasgow en 2002, sous la direction de Martyn Brabbins. Les autorités musicales d’Ukraine ont récemment montré un immense intérêt pour la vie et la musique de Bortkiewicz, et la 2e Symphonie a été donnée avec beaucoup de succès à Kiev à l’occasion du 125e anniversaire de la naissance du compositeur. Voici donc Bortkiewicz enfin rétabli et honoré dans son pays natal comme un compositeur de grande beauté, passion et mélodie. L’exilé est enfin rentré au pays. Wie schmerzlich dieses Gefühl manchmal ist, weiß nur derjenige, der gewaltsam vom Heimatboden getrennt wurde. Vielleicht ergreift die Sehnsucht nach der Heimat den Schaffenden, den Schriftsteller, den Komponisten am stärksten. Er möchte zurück „zu den Müttern“, wie Goethe sagt, zum Urquell, zur Heimaterde, um neue Kräfte zu sammeln, um seine Fantasie zu erfrischen, neu zu beleben. So der Komponist Sergei Bortkiewicz im Oktober 1936 im letzten Kapitel seiner Autobiographie „Erinnerungen“. Obwohl Wien seine „zweite Heimat“ bleiben sollte, war er ein Komponist im Exil und wie seine Komponisten-Kollegen Rachmaninov, Liapunov und Prokofiev auch, sehnte sich Bortkiewicz danach, in sein Heimatland, die Ukraine, die ihn so sehr inspirierte, zurückzukehren. Seine Musik ist von der Leidenschaft und dem melodischen Ausdruck seines Geburtslandes regelrecht durchdrungen. Am stärksten äußert sich dies in seiner Ersten Symphonie, die den Untertitel „Aus meiner Heimat“ trägt. Sergei Eduardovich Bortkiewicz wurde am 28. Februar 1877 in der ukrainischen Stadt Kharkiv (Kharkov) geboren. Seine musikalische Ausbildung sowie die familiären Verhältnisse, in die er hineingeboren wurde, finden sich ebenfalls bei vielen seiner russischen Zeitgenossen wieder. Seine Mutter war eine begabte Pianistin und hatte die Musikschule in Kharkiv mitbegründet. Diese war der „Kaiserlich-Russischen-Musikgesellschaft“, wo Bortkiewicz seinen ersten Musikunterricht erhielt, angeschlos­sen. Sein Klavierlehrer war Albert Bensch in Kharkiv und zu entscheidenden frühen Einflüssen wurden Anton Rubinstein und Tschaikowsky, die beide die Schule besuchten und einen unauslöschlichen Eindruck auf den jungen Komponisten in spé machten. Im Jahre 1896 immatrikulierte Bortkiewicz sich am St. Petersburger Konservatorium, wo er sich weiterhin auf sein Klavierstudium konzentrierte. Zunächst studierte er bei Karl van Arek (einem Schüler von Leschetizky) und später trat er der Theorieklasse von Anatol Liadov bei, um sein Studium vielseitiger zu gestalten. Jedoch schrieb er sich seinem Vater zuliebe, der der Ansicht war, dass die Musik keine angemessene Beschäftigung für seinen Sohn sei, an der Universität für Jura ein, und obwohl ihm das „Eintauchen“ in juristische Bücher jegliche Illusionen raubte, bestand er seine Prüfungen erfolgreich. Leider sollte dies nicht der Fall bei seinem Musikstudium sein. Aufgrund von studentischen Unruhen im Jahre 1899 musste das Konservatorium schließen, so dass alle Studenten ihr Studium um ein Jahr verlängern mussten. Für Bortkiewicz, der bereits drei Jahre an der Universität verbracht hatte, wurde dies zu viel und er beschloss, auf sein Abschlussexamen zu verzichten und stattdessen den obligatorischen, einjährigen Militärdienst im Alexander Nevsky Regiment zu leisten, während er sein Studium nebenher weiterführte. Wegen seiner instabilen Gesundheit und häufigen Krankheiten musste er allerdings seinen Militärdienst vorzeitig abbrechen. Im Sommer des Jahres 1900 kehrte er heim, um sich auf dem Landgut seiner Familie in Artiomovka bei Kharkiv zu erholen. Darauf entschied er sich, sein Musikstudium in Deutschland fortzuführen und immatrikulierte sich im Herbst 1900 am Leipziger Konservatorium. Er studierte Komposition bei Salomon Jadassohn und Klavier bei Alfred Reisenhauer. Letzterer war ein Schüler Liszts und selbst ein gefeierter Virtuose, den Bortkiewicz an der Musikschule Kharkiv gehört hatte und bald zutiefst verehrte. Bortkiewicz erlangte als Pianist nie den großen Durchbruch, den er sich erhofft hatte, obwohl er in jungen Jahren in ganz Europa (Wien, Belgrad, Berlin, Paris und Rom) Konzerte gegeben und den Schumann-Preis bei seiner Abschlussfeier in Leipzig gewonnen hatte. Gleichwohl war er sich seines pianistischen Scheiterns bewusst und sich darüber im Klaren, dass er nie an seinen Lehrer und Mentor heranreichen würde. Im Juli 1902 beendete Bortkiewicz sein Studium in Leipzig und verlobte sich während eines Sommers, den er auf dem elterlichen Landgut verbrachte, mit der Schulfreundin seiner Schwester, Elisabeth Geraklitova. Sie heirateten im Juli 1904 und kehrten nach Deutschland zurück, um in Berlin zu leben, da sie sich in alles Deutsche verliebt hatten. In seinen Memoiren machte Bortkiewicz deutlich, dass er fühlte, dass seine Ehe mit Elisabeth zu Größerem führen würde und schrieb: „Nun war ich verheiratet. Eine neue Periode meines Lebens begann.“ In diesem neuen Lebensabschnitt konzentrierte er sich darauf, ernsthaft zu komponieren. Wie viele vor ihm hatte Bortkiewicz sich in seiner Jugend am Komponieren versucht, fühlte nun jedoch, dass seine Reife und seine Fertigkeiten diese Kunst in den Vordergrund rücken würden. Sein erstes Werk war ein Klavierkonzert, op. 1, das in Berlin erfolgreich aufgeführt wurde. Später jedoch zerstörte Bortkiewicz das Werk aus unbekannten Gründen, verwendete aber Fragmente daraus in seinem Klavierkonzert Nr. 2 für die linke Hand, op. 28. Sein op. 2 war ein Liederzyklus und das op. 3 seine Quatre Morceaux für Klavier, erschienen bei Rahter. Von 1904 bis zum Ausbruch des Ersten Weltkriegs lebte Bortkiewicz glücklich in Berlin und besuchte seine Familie in den warmen Sommermonaten in Kharkiv. Ein Jahr lang unterrichtete er am Klindworth-Scharwenka Konservatorium, verließ diesen Posten jedoch nach einer Auseinandersetzung und konzertierte in Europa und Russland und nahm nach und nach seine eigenen Kompositionen in seine Programme auf. Als die Feindseligkeiten 1914 begannen, wurde Bortkiewicz unter Hausarrest gestellt und dann über Schweden und Finnland zurück nach Russland deportiert. Dies war ein vernichtender Schlag für ihn und ein bitterer Vorgeschmack auf sein zukünftiges Leben. Er kehrte nach Kharkiv zurück, wo sich die Lage zu beruhigen schien, und begann wieder zu unterrichten. Er baute sich einen Kreis von vielversprechenden Schülern auf, von denen die meisten ursprünglich in Moskau oder St. Petersburg studiert hatten, aber aufgrund des voranschreitenden Krieges im südlichen Teil Russlands bleiben mussten. Bortkiewicz machte sich daran, seine Karriere weiterzuführen und lernte während dieser Zeit Scriabin und Taneyev in Moskau kennen. Am 25. März 1918 schließlich wurde Kharkiv von den Deutschen besetzt und der Komponist konnte seine Freude darüber kaum verbergen, wieder Deutsche als Nachbarn zu haben: „Nach drei Tagen herrschte völlige Ordnung: wir hatten Licht, Wasser, Brot, die Züge verkehrten tadellos. Die deutsche Organisationskunst war wirklich bewunderungswürdig. [...] Ich befreundete mich mit einigen deutschen Offizieren und fungierte oft als Dolmetscher.“ Die Deutschen blieben jedoch nur bis November und nach ihrem Abzug sollte das nächste Unglück über sie hereinbrechen—der Bürgerkrieg. Wie bei allen Revolutionen steigerten sich die Gräueltaten schnell und das Gut der Familie Bortkiewicz in Artiomovka wurde völlig ausgeplündert. Als die Gegend zum Zankapfel zwischen der Roten und Weißen Armee wurde, musste der Komponist mit anschauen, wie seine Mutter und sein Schwager an Typhus erkrankten und schließlich im Chaos von Novorossysk starben, wohin die Familie geflohen war. Der Komponist und seine Frau entschieden sich dazu, nach Sevastopol auf der Halbinsel Krim zu reisen, um von dort aus weg von Russland und zurück in die Freiheit zu gelangen. Schließlich konnten sie sich eine Überfahrt auf einem Handelsdampfer, der Konstantin, ergattern, der sie im November 1919 völlig mittellos aber sicher nach Konstantinopel brachte. Der türkische Pianist Ilen Ilegey, Hofpianist im Dienste des Sultans, half Bortkiewicz, sich in Konstantinopel zu etablieren. Er kannte die Werke des Komponisten und empfahl ihn den Würdenträgern der Stadt. Nach kürzester Zeit gab Bortkiewicz der Tochter des Hofkapellmeisters, der Tochter des belgischen Gesandten und der Ehefrau des jugoslawischen Gesandten Stunden und wurde als Gast zu vielen Empfängen in den großartigen Botschaften in der Stadt geladen. Trotz seines wachsenden Rufes vermisste Bortkiewicz die Musik und Kultur Europas und zog schließlich im Juli 1922 zusammen mit seiner Frau nach Wien. Zu diesem Zeitpunkt brach er seine autobiographischen Aufzeichnungen ab, so dass jegliche Informationen über sein Leben den vielen Briefen, die er an seinen guten Freund und Gönner, den niederländischen Pianisten Hugo van Dalen (1888–1967), schrieb, entnommen werden mussten. Es war geplant, dass der Umzug nach Wien der letzte sein sollte und Bortkiewicz etablierte sich bald in der Musikszene der Stadt. Im Jahre 1926 erhielt er die österreichische Staatsbürgerschaft, jedoch übte Deutschland immer noch eine starke Anziehungskraft auf ihn aus, so dass er 1928 mit seiner Frau zunächst für ein halbes Jahr nach Paris zog und von dort aus nach Berlin, wo er fast fünf Jahre blieb. Mehrere seiner Werke erschienen in dieser Zeit bei Litolff und Rahter. Mit dem Erstarken der Nazis 1933 jedoch musste er als Russe Berlin und Deutschland wiederum verlassen. Er kehrte nach Wien zurück, um sich dort durchzuschlagen, als Europa sich für die Invasion und den Krieg rüstete. Der Zweite Weltkrieg bedeutete für Bortkiewicz erhebliches Elend, obwohl seine Musik für eine kurze Zeit (trotz seiner frühen Verfolgungsangst) unter den Nazis Anerkennung erlangte und Aufführungen sowohl in Wien als auch in Berlin stattfanden. 1934 begann der Komponist mit den Skizzen für seine Erste Symphonie. Die Zweite folgte kurz darauf. Beide Symphonien und seine Oper Akrobaten sollten in diesen trostlosen Jahren uraufgeführt werden. Als sich jedoch das Blatt gegen die Grausamkeiten der Nazis wendete, wurden die Lebensumstände für den Komponisten zusehends schwieriger. In einem Brief an seinen Freund Hans Ankwicz von Kleehoven berichtete er, dass er aus dem Badezimmer schreiben müsse, in das sie gekrabbelt seien, weil es klein und mit einer Gaslampe beheizbar sei. An die Benutzung der anderen Zimmer sei gar nicht zu denken und sein Klavier dürfe er auch nicht anfassen. Völlig verzweifelt schilderte er, dass das Leben immer unschöner und unbarmherziger würde. Tatsächlich hatten die Bomben das Klavier und das Haus des Komponisten zum größten Teil zerstört. Später, als die Russen Wien besetzt hatten, schützte er sich sowie einige Nachbarn davor, erschossen zu werden, indem er mit dem Befehlshaber russisch sprach. Die Auswirkungen des Krieges waren noch viele Jahre lang spürbar und brachten Bortkiewicz an den Rand des Ruins. Er verlor alle Einkünfte, die er zuvor durch den Handel mit den Notendrucken seiner Werke erzielt hatte, da in den Bombenangriffen fast alle Kompositionen, die von seinen deutschen Verlegern gedruckt worden waren, zerstört wurden. Der Mangel an Nahrung, Heizung, Kleidung und den elementarsten Erfordernissen verursachte Elend und schwere Krankheit bei Bortkiewicz und seiner Frau. Dank des Eingreifens eines Freundes, Dr. Zdrahal, wurde das Ehepaar in das Franz-Joseph-Hospital in Wien eingewiesen, um dort zu genesen. Dennoch sollten die Qualen des Krieges bei Elisabeth bleibende Folgen haben: sie litt für den Rest ihres Lebens an manischen Depressionen. Im Herbst 1945 wurde Bortkiewicz zum Direktor einer Meisterklasse am Wiener Konservatorium ernannt, was eine gewisse finanzielle Sicherheit bedeutete. Später, als er in den Ruhestand getreten war, erhielt er eine Ehrenpension und im Jahre 1947 wurde anlässlich seines 70. Geburtstages auf die Bestrebungen von Hans Ankwicz von Kleehoven hin die „Bortkiewicz-Gesellschaft“ gegründet. Der Komponist hatte in der Stadt viele Freunde und Gönner und jede Woche wurden Konzerte im Künstlerhaus veranstaltet, in denen er nicht nur mit seinen Kompo­sitionen zu hören war, sondern auch Lieder, Instrumentalstücke und Klavierbearbeitungen seiner symphonischen Werke aufgeführt wurden. Am 25. Februar 1952 konnte die Bortkiewicz-Gesellschaft mit dem RAVAG-Orchester den 75. Geburtstag des Komponisten im Musikvereinssaal mit einem Konzert feiern, in dem Bortkiewicz sein Klavierkonzert Nr. 1, op. 16, das Lyrische Intermezzo für Violine und Orchester und seine Erste Symphonie dirigierte. Es sollte sein letztes großes Konzert sein und die Begeisterung zu diesem Anlass ist in einem Brief illustriert, den der Komponist an Van Dalen schrieb. Endlich habe er in einem großen Konzertsaal mit einem großen Orchester und Solisten die Gelegenheit gehabt, zu zeigen was er könne. Nicht nur die Kritiker, sondern auch seine anderen Bekannten seien überrascht und beeindruckt gewesen. Er würde sich immer darüber freuen können, im Alter von 75 Jahren soviel Anerkennung erlangt zu haben, was ja in den meisten Fällen sich erst nach dem Tod desjenigen, der es wirklich verdiene, einstelle. Bortkiewicz hatte schon seit einiger Zeit an Magenbeschwerden gelitten und auf das Anraten eines Arztes hin unterzog er sich im Oktober 1952 einer Operation. Er erholte sich davon nicht und starb in Wien am 25. Oktober desselben Jahres. Seine Frau Elisabeth, die kinderlos blieb, starb acht Jahre später, also 1960, in Wien. Bortkiewicz und seine Frau liegen auf dem Zentralfriedhof in Wien begraben. Bortkiewicz’ Stil lehnt sich sehr an Liszt und Chopin an und wurde durch Tschaikowsky, Rachmaninov, den jungen Scriabin und russische Folklore angereichert. Die musikalischen Strömungen des 20. Jahrhunderts beeinflussten ihn nicht—der Komponist betrachtete sich selbst nie als „Modernisten“, wie seinem Künstlerischen Glaubenbekenntnis (1923) zu entnehmen ist. Im New Grove (1980) steht folgendes über ihn geschrieben: „Seine Arbeit ist sorgfältig, seine Phantasie schillernd und sensibel, seine Klavierkompositionen idiomatisch; die Instrumentation ist üppig und unterstreicht die wichtige Sentimentalität der melodischen Erfindung“. Doch Bortkiewicz war nicht nur ein Epigone—er hatte sehr wohl seinen eigenen Stil, der sich auf die Einflüsse in seinem Leben berief und sofort als typischer „Bortkiewicz-Klang“ erkannt werden kann. Bortkiewicz hat zwei Symphonien komponiert und in seinem letzten Lebensjahr die Skizzen für eine dritte angefertigt. Die Erste Symphonie, op. 52, entstand im Herbst 1934, als Bortkiewicz sich in einer finanziellen Notlage befand. In einem Brief vom 21. November 1934 an Van Dalen berichtete er über seine Arbeit an der Symphonie, der er den Titel „Aus meiner Heimat“ geben würde. Für ihn war sie sein bis dahin größtes Werk, von dem bereits drei Teile in Skizzen komponiert seien. Mit einer Todesahnung bat Bortkiewicz seinen Freund, ihm bei der Fertigstellung des Werks behilflich zu sein, damit er in Frieden sterben könne. Er beendete die Arbeit an der Symphonie um Weihnachten desselben Jahres und musste selbst die Orchesterstimmen herausschreiben, da er es sich nicht leisten konnte, jemanden dafür anzustellen. Die Uraufführung wurde in Wien am 30. März 1935 von den Wiener Symphonikern unter der Leitung von Rudolf Nilius gegeben. Das Konzert wurde in ganz Europa ausgestrahlt und Bortkiewicz bat Van Dalen, den Kapellmeister Mengelberg darüber zu informieren. In einem Brief vom 10. April 1935 an Van Dalen schrieb der Komponist über seinen Enthusiasmus nach der ersten Aufführung und dass er hoffe, dass mögliche Aufführungen in Deutschland ihm aus seiner Finanzmisere helfen würden. Über die beiden folgenden Jahre gibt es kaum schriftliche Zeugnisse, jedoch schreibt der Komponist in einem Brief, der auf den 20. Februar 1937 datiert ist: „Am 2-ten März wird im Radio-Frankfurt meine erste Symphonie aufgeführt, wie Herr Kapellmeister Rosbaud ausschreibt „zu Ehren meines 60-ten Geburtstages““. In weiteren Briefen vom März und April dieses Jahres wird jene Aufführung bestätigt (die zudem auf Schellackplatten aufgenommen wurde, um sie auch später wiedergeben zu können) und auch erstmals die Zweite Symphonie angekündigt. Bortkiewicz berichtet, dass er in Stuttgart am 30. März 1937 die Aufnahme seiner Ersten Symphonie gehört und außerdem wenig später den vierten Satz seiner Zweiten Symphonie, die ganz anders sei als die Erste, beendet habe. Im Mai 1937 schrieb der Komponist, dass seine Zweite Symphonie nun fertig sei und in der nächsten Saison uraufgeführt würde. Sie sei anders strukturiert als die Erste Symphonie und er sei selbst der Meinung—und Freunde hätten dies bestätigt—dass er mit der Zweiten erfolgreich gewesen sei und dass sie möglicherweise noch charakteristischer sei als die Erste. Letztere würde bald in Prag und Karlsbad gegeben. In weiteren Briefen wird über beide Symphonien berichtet sowie über die Versuche des Komponisten, sie einer Reihe von Dirigenten vorzustellen. Trotz der sich zusammenziehenden Kriegswolken in Europa wurde die Erste Symphonie mehrmals unter der Leitung von Kabasta und Steiner aufgeführt. Mengelberg zeigte wohl besonderes Interesse; Bortkiewicz schrieb, dass Mengelberg ihn gegrüßt hatte, und als er begann, seine Symphonie zu spielen, Mengelberg so interessiert war, dass er nicht nur die ganze Symphonie hören wollte, sondern auch lange darüber sprach und sie gerne aufführen wollte. Gleichwohl scheint Mengelberg sie nie dirigiert zu haben. Als Europa sich jedoch später in dem Jahr für den Krieg bereit machte, blieben auch die Aufführungsversprechen auf der Strecke. Die Partituren der beiden Symphonien befanden sich bei Van Dalen und der Komponist hoffte darauf, dass sie unter der Leitung von Eduard Flipse in Rotterdam aufgeführt würden. In mehreren seiner Briefe aus den Kriegsjahren sprach Bortkiewicz über seine Symphonien und zeigte sich besorgt über die beiden Partituren, die immer noch in Holland waren, als der Krieg 1942 voranschritt. Wegen einer deutschen Anordnung, dass handgeschriebenes Material und Manuskripte in Europa nicht mit der Post versandt werden durften, blieben die Partituren während dieser Zeit im Besitz von Van Dalen. Für kurze Zeit bestand die Hoffnung, dass das Residentie Orchester eine Aufführung der Zweiten geben würde und der Komponist hatte die Orchesterstimmen sogar eigenhändig angefertigt, jedoch schlug diese Möglichkeit fehl. (Allerdings kann angenommen werden, dass der Komponist eine Abschrift, möglicherweise einen Rohentwurf, besaß.) Als dann Europa unter der Naziherrschaft erdrückt wurde, brach die Korrespondenz zwischen Komponisten und Pianisten bis zum Sommer 1946 ab. Obwohl dem Komponisten in den frühen Kriegsjahren noch einige Konzerte mit seinen Werken vergönnt waren, wurden diese 1944 verboten, da Bortkiewicz und seine Musik als zu russisch eingestuft wurden. Bis zum September 1947, als Bortkiewicz bemerkte, dass Flipse immer noch die Zweite aufführen wollte, findet sich kein Hinweis auf die Symphonien. Der Komponist hatte einige Änderungen in den Orchesterstimmen vorgenommen und wollte diese in die Partitur eintragen, die sich immer noch bei Van Dalen befand. Weitere Bitten um das Zurückschicken der Symphonien deuten darauf hin, dass sie die folgenden zwei Jahre in Van Dalens Besitz blieben und das vorgeschlagene Konzert von Flipse nicht stattfand. In den restlichen überlieferten Briefen des Komponisten werden die Werke nicht mehr genannt. Leider existieren keine genaueren Zeugnisse über die Meinung des Komponisten über seine zweite Symphonie. Ebenso wenig existieren in einer Zeitspanne von fünfzig Jahren Zeugnisse über Aufführungen, bis das Werk schließlich im Februar 2002 von Mykola Sukach bei einem Bortkiewicz Festival in der Ukraine anlässlich des 125. Geburtstages des Komponisten dirigiert wurde. Der erste Satz, „Allegro ma non troppo“ in es-Moll, beginnt mit einem sanften Ruf der Oboe, der sofort die Melancholie evoziert, von der das Werk geprägt ist. Da dieses Eröffnungsmotiv im ganzen Orchester herumgereicht wird, scheint der Komponist ein Gefühl der Ungewissheit und veränderlicher Stimmungen ausdrücken zu wollen, das sich von Hilflosigkeit zu titanischer Kraft steigert. Die Blechbläser setzen mit einer Phrase ein, die eine hymnusartige Reverenz reflektiert, die wiederum das zweite Thema bei den Streichern einleitet—eine Melodie, die von russischer Seele durchdrungen scheint und die sanft zu einem kurzen, aber leidenschaftlichen Höhepunkt anschwillt, bevor sie in die unteren instrumentalen Tiefen des Orchesters zurückkehrt. Das Eröffnungsmotiv kehrt wieder und vergrößert langsam seine Ausmaße, als es zum Teil einer Durchführung wird, in der alle Themen vorkommen. Insgesamt gesehen drückt dieser Satz dasselbe Gefühl des Verlusts und der Trauer aus, das auch in den schriftlichen Äußerungen des Komponisten aus der Zeit vorherrscht. Der zweite Satz ist ein Scherzo, mit „Vivace“ überschrieben, und stellt ein Gegengewicht zum ersten Satz dar. Anders jedoch als das heitere Scherzo seiner Ersten Symphonie drückt dieser Satz, ebenso wie der vorangehende, Trauer aus. Die Themen scheinen eher dramatisch als spielerisch, besonders jene, die von den Blechbläsern angekündigt werden und ein „Schicksalsthema“ ausrufen zu scheinen. Im ersten Teil dieses Satzes herrscht eine fast manische Energie vor—ein Vorgeschmack des Irrsinns, der den Komponisten bald verschlingen und die Völker Europas in den Krieg manövrieren sollte. Es klingt hart und gnadenlos, eine Flut der Kraft, die endlos weiterzumarschieren scheint, unaufhaltsam. Zu diesem Zeitpunkt hatte Bortkiewicz sowohl einen Weltkrieg als auch einen Bürgerkrieg miterlebt und man kann seine offensichtliche Angst davor, was noch kommen würde, spüren. Im Trio kommt die Musik kurz zur Ruhe, doch die Rückkehr zum Vivace sorgt für ein wachsendes Gefühl der Bedrohung. Der dritte Satz ist eine tragische Klage. Es ist dies das emotionale Herz der Symphonie, in dem Bortkiewicz seine ganze Trauer und Desillusionierung der Welt ausdrückt. Zunächst ist keinerlei Freude oder Friede zu spüren, sondern nur emotionale Kraft; als der Satz jedoch voranschreitet, scheint der Ruf einer Klarinette eine gewisse Hoffnung zu signalisieren, bevor sie von dem gequälten Klagelied der Streicher geschluckt wird. Dieser eindringliche und schöne Satz scheint einer vergessenen Zeit, einem vergessenen Ort und Volk nachzutrauern. Wenn der dritte Satz den Eindruck vermittelt, eine Reinigung erreicht zu haben, dann wird der Hörer von dem Finale der Symphonie, „Vivace (alla breve)“, von der mächtigen und gewaltigen Stimmung verschlungen. Das Kernstück ist ein wilder slawischer Tanz, der, als er zur Coda gelangt, das kraftvolle und brutale „Schicksalsthema“ des zweiten Satzes zitiert. Der überschwängliche Schluss des Werks lässt eine große Frage offen: werden Angst und Verzweiflung schließlich alles Leben zerstören oder wird die Menschheit es zu guter Letzt schaffen, ihr Schicksal zu bestimmen? Der Mensch, Musiker und Komponist Bortkiewicz bleibt weiterhin ein Rätsel, da so viele Einzelheiten seines Lebens verloren sind oder von den Flammen des Zweiten Weltkrieges zerstört wurden. Eine ganze Reihe seiner Werke ist immer noch verschollen—ein Lyrisches Intermezzo für Violine und Orchester (op. 44), die Oper Akrobaten (op. 50), mehrere Klavierwerke seiner späteren Schaffensperiode, darunter die Sechs Préludes (op. 66), Drei Mazurken (op. 64), eine Cellosonate (op. 36) und sechs Stücke mit dem Titel Miscellana (op. 61), um nur einige wenige zu nennen. Er schrieb sogar ein Olympic Scherzo für die Olympischen Spiele 1948 in London und gewann einen Preis dafür, trotzdem fehlt heute jede Spur von diesem Werk. Auch die Symphonien standen einst auf der „Vermisstenliste“ und verschiedene Forscher, unter ihnen der Autor dieses Textes, haben sich viele Jahre lang darum bemüht, sie ausfindig zu machen. Obwohl sich in diversen Briefen Hinweise darauf fanden, dass die Symphonien im Besitz von Van Dalen seien, stellte sich dies als falsch heraus—jedoch wurden erfreulicherweise unter den Dokumenten des Pianisten die Russische Rhapsodie und die Zweite Klaviersonate gefunden. Im Laufe der Jahre wurde allgemein angenommen, dass die Symphonien entweder in den Kriegsjahren verschollen sein mussten oder aber in den Nachkriegsjahren, als ganz Europa in Trümmern lag. Der Autor hatte eine Reihe seiner Manuskripte in verschiedenen europäischen Bibliotheken und Archiven ausfindig gemacht, doch trotz aller Bemühungen blieben die Symphonien unfassbar und wurden als „verschollen“ klassifiziert. Doch dann griff das Schicksal mit einer leitenden Hand ein. Nach mehreren recht bizarren Zufällen erwarb der Autor in einem Antiquariat eine zweibändige Ausgabe einer Liste von Werken, die sich im Besitz der Fleisher Collection in Philadelphia befinden. Als ich etwas später am gleichen Abend einen der beiden Bände in die Hände nahm, fiel ein kleiner Zettel aus dem Buch. Darauf waren die Anschaffungen der Bibliothek im Zeitraum von etwa 1950 bis 1952 verzeichnet und unter „Bortkiewicz“ wurden zwei Symphonien genannt. Ich setzte mich mit der Bibliothek sofort in Verbindung und nach einigen Überprüfungen wurden die Partituren im Archiv gesichtet. Anscheinend hatte Bortkiewicz Abschriften der Symphonien (Partituren und Orchesterstimmen) der Bibliothek zur sicheren Aufbewahrung gesandt. Nach weiteren Forschungen wurde später noch eine Abschrift der Ersten Symphonie im Doblinger Archiv in Wien entdeckt. So können die Symphonien nun nach über fünfzig Jahren der Stummheit wieder zu Gehör gebracht und geschätzt werden. Zunächst wurde die Erste Symphonie in Kiev im Jahre 2001 gegeben, gefolgt von der britischen Premiere in Glasgow ein Jahr später unter der Leitung von Martyn Brabbins. Die Musikzuständigen in der Ukraine haben neuerlich großes Interesse am Leben und Werk von Bortkiewicz gezeigt, und um den 125. Geburtstag des Komponisten zu ehren, wurde eine Aufführung der Zweiten Symphonie in Kiev unter großem Beifall gegeben. Zu guter Letzt hat Bortkiewicz auch hier, in seinem Heimatland, Anerkennung gefunden und ist als Komponist von großer Schönheit, Leidenschaft und Melodie geehrt worden. Endlich ist er aus dem Exil zurückgekehrt.